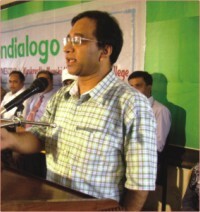 As a finalist of the Second Round of Mondialogo School Contest 2005-2006 we organized a Mondialogo Day on the premises of Birshrestha Munshi Abdur Rouf Rifles College, Peelkhana, Dhaka on 18 July. More than 150 educators, students and officials from different schools and other organizations participated in the day observance programme. 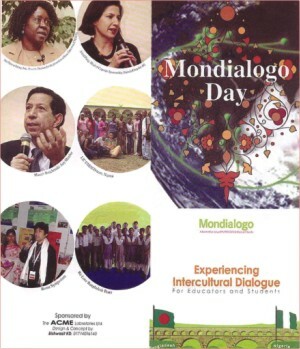 Mondialogo is a platform for educators and students for inter-cultural dialogue . UNESCO, in cooperation with DaimlerChrysler has initiated Mondialogo since 2003 to provide education that will help the young generation of today to become better leaders of tomorrow. It helps people to appreciate cultural diversity, respect for difference, and interact with other cultures through intercultural dialogue. In this age of globalization, dialogue among different cultures and civilizations can only bring one out of his/her own prejudices and limitations. Though both the platforms necessitate performing some practical activities, the only aim of all these is developing intercultural dialogue. Mondialogo School Contest started in October 2003 and has by now experienced two rounds. The First Round was in 2003-2004 in which 1500 teams from 126 countries participated. The total number of participants counted 25000. The Second Round was hailed much enthusiastically. In this Round of 2005-2006, 35000 people from 2600 teams of 138 countries participated. The methodology that Mondialogo teams is suggested to follow is: I, You and We process. In details it encourages every team member to know about one's own culture, history, tradition, values, festivals, religions and language more and more. Then it inspires to know all of these of the peer team as much as possible which is termed as 'You' phase. In the 'We' phase the most extensive dialogues and exchanges take place. Within this phase, intercultural dialogue enables students to not only exchange their views but to share ideas and reflections on a wide range of crucial issues like non-violence, sustainable development etc. After being introduced the team members can start to talk in whatever means they want like: writing through post, making phone calls, sending fax or mailing electronically. The peer discussion may start in making simple questions: personal, cultural, national and what not? The huge but easily accessible web portal of Mondialogo is the main resource to work on the project and develop intercultural dialogue. Go straight to Mondialogo web site www.mondialogo.org and you will reach the wider horizon. Click the Mondialogo School Contest icon and you will get a list. If you dive into the list you can find all the team pages or profiles of the team leaders and other participants. The site can take you to the first Mondialogo contestant teams as well. Moreover there are the newsletters, discussion threads etc. Every week a question is given to all the teams and the teams are to give the answers. Everyone can see those answers and compare how different the answers could be! The questions that were given every week inquired about academic as well as cultural aspects. The programme of the observance of Mondialogo Day had many splits: Inauguration of the day, rally, planting a sapling, keep the day in memory, and discussion by experts on intercultural dialogue and so on and so forth. Dhaka Residential Model College, Government Laboratory High School, Motijheel Govt. Girls High School, Dhaka Collegiate School, St. Gregory's High School, St. Joseph Higher Secondary School, Mohammadpur Govt. High School, Azimpur Girls' School and College, Engineering University Higher Secondary School, Rajuk Uttara Model College, Sher-e-Bangla Nagar Govt. Girls High School etc. All the schools reported at the Information centre first where Sizan and Himel, the two active college Unesco Club members were engaged in distributing the caps and brochures. What a surprise to get a cap inscribed Mondialogo Day! Nazmul Kabir and Showkat Hossain, the club advisors, greeted the new teachers and students. Later on we all awaited the arrival of Malama Mileisea, the UNESCO Country Director. By then came Imdadul Haq Milon who was warmly cheered by the present students. When Malama along with Dr Mahmudul Hassan, the Secretary of Bangladesh National Commission for UNESCO and Mahbubuddin Chowdhury, the Secretary General of Unesco Clubs Bangladesh came, all people gathered around the inauguration place. Malama declared the opening of the day by flying the 'Mondialogo' inscribed balloons and festoon. Aysha was very sincere in her job here, while Safa announced everything well. When the biggies stood for the rally with the banner all joined the UNESCO club members as well as the guest teachers and students. After the rally when everyone was rushing to the auditorium, the Chief Guest from UNESCO Dhaka office planted a sapling where the teacher-advisors of the college UNESCO club Sultan Farid and Abu Darda accompanied. Manjurul Karim, the teacher representative of the college was also very helpful on the day. Later on the discussion started. Nandini Roy Chowdhury conducted the whole programme. First came the present writer to share his experience in Mondialogo of the last two years. Zinia Rahman Bipasha, a participant of last year's finalist 'We Love Bangladesh' team narrated how they developed their dialogue with the Nigerian peer team. Later on guest teachers like Uttam Halder, Md Mostafa Bhuiyan, K.M.Hasan Imam, Solaiman Kabir, Mustafizur Rahman, Shyamal Datta, Abdul Ahad, Aminul Haque and Humayun Kabir of different schools introduced themselves. Then Dr. Mahmudul Hassan, explained their role in ASPnet (Associated School Project Network) activities. Prof Asif Nazrul, Fictionist Imdadul Haq Milon, and Prof Fakrul Alam tried to motivate the students talking about the different facets of intercultural dialogues. UNICEF official Saidul Milky presented in his unique way. Malama took the microphone out of the stand and started with the question 'What does UNESCO stand for?' The chair, Principal Mia Md. Moniruzzaman, thanked everyone to share the new idea. After the discussion, the eminent guests left and then started the jolly mood with the refreshment. Some sang songs while some came up with stand up comedies. Afterwards some teams bade farewell, some stayed back to attend the computer lab where computer expert Santosh Kumar Basak was waiting to show how to register in Mondialogo School Contest. Mondialogo is for teachers and students. Any student between 14-17 years can enroll in a team. You have to go to the internet at the site www.mondialgo.org and register your team. Everyone is requested to feel free to contact Subrata Kumar Das, the Mondialogo teacher of the country at subratakdas@yahoo.com or at cell 01911-347058 or 01912-830393. Intercultural dialogue is a part and parcel of quality education of the 21st century. Interdisciplinary approach, team teaching, participatory and creative methods, effective use of ICTs are the essential components of intercultural dialogue. Mondialogo School Contest emphasizes these needs and creates environment to practice them.